Down on his luck and facing financial hardship, Gerry teams up with a younger charismatic poker player named Curtis in an attempt to change his luck. The two set off on a road trip through the South with visions of winning back what has been lost. Are you expecting to witness a brilliantly conceived plan that’s used in a bet as in “Focus“? A breathtaking scene with Will Smith raising the stakes alarmingly and taking off with a shitload of money. Or do you think you’ll see an “all or nothing” poker game like Matt Damon shows in the magnificent movie “Rounders“? Then I should inform you that you’ve backed the wrong horse. “Mississippi grind” looks more like a mix of “The Gambler” and “Wild Card“. Just as Wahlberg in “The Gambler“, Gerry (Ben Mendelsohn) is someone who should stop gambling, because clearly good fortune isn’t on his side. And just like Statham seems his luck turns at the right time. But still. This slow and at times monotonous film feels differently. Be assured. After watching this film you certainly won’t feel the irresistible urge to put on a tuxedo and quickly head to the nearest casino. Despite the fact that the central theme is gambling-oriented, you’ll realize after a while that it really is about something else. It could just as well be about two florists, who travel across America while demonstrating their floral art and finally arrive at the world championship “Bonsai-cutting”. It’s that trip and the interaction between the two individuals that are particularly important here. You travel as it were together with these two complicated characters. First there’s Gerry. A typical example of an inveterate gambler who’s pursuing the impossible dream to win big one day with his gambling. He’s aware of his desperate situation and thus he’s drawn into an irreversible bankruptcy. The “big profit” is still to be achieved. Besides the immense mountain of debt he built up over the years, his personal life is also a mess. His wife left him. He hasn’t seen his daughter in years. And although he’s actually fooling himself all these years, he’s still honest enough to admit his weakness to a strange girl: “I have a problem with money“. Next Curtis (Ryan “RIPD” Reynolds) appears at the scene. A carefree charmer who just wanders around and seemingly has a girlfriend in every state. He’s a smooth talker who gets everyone on his side that way. Similarly Gerry who’s intrigued by this loner. He can’t get hold of Curtis during a poker game. Even the monotonous voice on the tape he listens to in the car, can’t help him. The endless list of traits and tics that some players show during poker, doesn’t apply to Curtis. Gerry is convinced that Curtis is a kind of a good luck charm. A rabbit’s foot so to speak. And together they leave for New Orleans to participate in a legendary poker tournament. What follows is a grubby road movie showing the formation of an intimate bond between two total strangers. The trip leads along dark gambling halls and with neon equipped bars where lots of “Woodfords” are served. A sparkling and at the same time dramatic psychological observation about addiction and self-esteem. Superbly played by Reynolds and Mendelsohn. Both have their own demons to fight and despite their contrary character, they fit perfectly together. 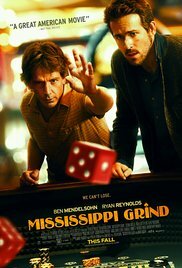 “Mississippi Grind” shows how someone tries to reverse his good fortune and in that way tries to obtain a new and better life.